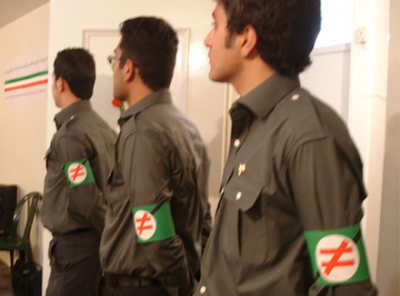 Green Voice of Freedom via Persian Banoo: The Pan-Iranist Youth Organization reports: Thursday evening the home of Reza Kermani was raided and ten members of the Paniranist party were arrested and taken to the police station in Shahrak Naz in Karaj. The Pan-Iranist party announced the names of the detainees as follows: Hojat Kalashi, Ozhen Akbari, Farhad Baghbani, Kasra Alasavand, Hooman Eskandari, Hossein Shahriyari, Alireza Solaimani and Hossein Javid. "The only reason Hitler came to power was the stupidity of Stalinists, not to unite with Social Democrats against Hitler." Ahh… silly me, of course! ..…The only reason Khomeini came to power was the stupidity of the Stalinists (read all the leftists, national front and others), not to unite with monarchists, constitutionalists and the lone Bakhtiar against Khomeini. Any comparison and parallels drawn between sumka with Euro-Nazis is pre-mature and opportunistic at this point in time. They (sumka) have a formidable enemy called, ISLAM, and the Islamic republic that controls vast resources of an oil producing country, and an Islam conquered society. They have yet to define themselves in their struggle against Islam and Islamism. They will have a tough fight ahead of them, as we have all learned, that fighting this Islamic curse from inside will require a militant-paramilitary approach. The final blow to the IRI will be a violent one. Once the critical mass is reached, the final blow may be limited with minimum cost to everyone. Else, a civil war, in the worst case. No doubt that post IRI, some faction may decide to follow the steps of the Euro-extremists, but this prediction is pre-mature at this time. But, more importantly, there will be a more rational role for a right wing nationalist movement in the post IRI. They will be the counter-weight to the Islamist movements, for decades to come. The only reason Hitler came to power was the stupidity of Stalinists, not to unite with Social Democrats against Hitler. First learn the actuall history, then make a fundament out of yourself. But for our monarchists making fools out of themselves is not limited to their non-understanding of history. So, your basic argument is that because Pan-Iranist youth are ultra-nationalist, just their political affiliation takes away all their rights as citizens of the country. This 'claim' is so stupid it even makes dogs in the street laugh. You're the one who picks and choses, which political prisoner to support and which one not to; according to your sectarian obtuse monarchist "reading," and I'm narrow-minded!? Check yourself. At the bottome idiotic monarchists are as sectarian, as any sect. Excelelnt rebuttle dear DK. There is no hope for authoritarian hate-mongers and vindictives spewing tired old propaganda fabricated by the Communists and the West. This particular entity's brand of hate toward monarchy is pathological and excessively personal. Don't waster your time. The Nazis rose to Power quite democratically under the Republic of Weimar which offered them that possibility after the Fall of the German Monarchy. The German and Austrian Aristocracy were by large anti Nazi and that explains why folks like Stauffenberg and Rommel tried to eliminate Hitler when they realized that his only aim was to ultimately destroy Germany with his nihilistic ideology. That in itself shows the level of historical ignorance, your lack of general education in political philosophy and the narrowmindedness which characterizes the mindsets of self righteous folks like you and which I think I am not the only one on this website to have noticed it. And lastly for someone whose grandparents fought the nazis including in the French Resistance I won't be lectured on WW 2 or on the ramifications of Fascism and Nazism by a fellow like you with a fairly poor knowledge of some of the great challenges humanity faced in the 20th Century with the rise of Totalitarian ideas. Otherwise you would see the difference between a dictatorship and a totalitarian state, a Constitutional Monarchy and an Absolute Monarchy, a Democracy and a Theocracy. I'm afraid you fall short on every account ! So Spare me your Self Righteous remarks ... I have no time for your childish outbursts. Why Adolph Reza Khan and most monarchists will always be idiots? Which simply means everyone is free to think whatever they please, and no individual or institution has any rights to question them. As long as no acts of violence or crime has occured, there's no basis for any prohibition of any type. In this specific case below, the only "crime" Pan-Iranist youth have committed is to question the state and its authorities. Once those youth are in jail, behind those bars, they deserve everyone's unconditional support for their freedom. If Iran ever gets to that democratic system of government we all aspire to whether in the form of a Secular Republic ( a disaster in my opinion) or a Parliamentary Democracy in the form of a Constitutional Monarchy ( highly unlikely given all the Pahlavi Character assassinations they have unfairly been subject too) ... The Pre 79 generation will be held accountable for the national humiliation they have subjected their country to for the past 3 decades by delivering the land of Cyrus and Darius to a bunch of smelly and unattractive mullahs. That hurt pride will rise in an unpredicatable form one way or another and the only people responsible for this are those who tried to distort history and bashed the Pahlavis for ALL THE WRONG REASONS and who to this day claim their revolution was highjacked ! Constitutionalist's Rebuttal of Republican Assessment that Revolution was "Highjacked"
For they have never done their "examen de conscience" and try to find excuses for their own errors by putting the blame on the Shah and the Pahlavi Rule. Keh Yek Film Mesleh ARGO ham koli Cherto Pert roh beh soorateh Tarikh Bayan meekoneh ! How can we seriously explain that the revolution was "highjacked" when what Iran needed was not revolution but Reform back in 1979 ? where as today in a country that has ALL the right reasons to revolt Our so called ANN TELECTUALS are preaching reform ? How YOUR "Green" Color Was Chosen & By WHOME ! The Greens have lost it, the Monarchist have lost it so the avenue is open for any other nitwit demagogue who can canalize this nationalistic frustration and direct it towards other means than democracy and human rights. Ultimately all of you folks who insult Reza Shah will regret that by Character Assassinating that great man and his achievements you will be pushing another clueless generation into the hands of a far more radical movement which may well put an end to all your democratic aspirations on the long run. IRI Celebrating Reza Shah or Merely Highjacking his Nationalistic Fiber ? After 34 years of unfathomable barbarism of the Messianic Islamist Rapists, “reformers” and all, regime change is the only way out. Support Hojat , Ozhen , Farhad , Kasra, Hooman , Alireza,...NOW! Dear virtual friends, and foes, please take a few minutes out of your schedule to write a letter of support for these incacerated youth. A few minutes from you would go a long way for these innocent young folks. Many thanks in advance. continue to witness many independent political activists brutally persecuted and unjustly imprisoned in Iran. Eskandari, Hossein Shahriyari, Alireza Solaimani and Hossein Javid. who have been unjustly incarcerrated only because of their independent views and social activitism.